Denver, Colorado. July 12, 2014 – United Launch Alliance will create history with the first ever night launch of a giant sport rocket at an FAA-sanctioned air show. The rocket, Stars ‘N’ Stripes, will launch at the Rocky Mountain Air Show on August 22 and 23. 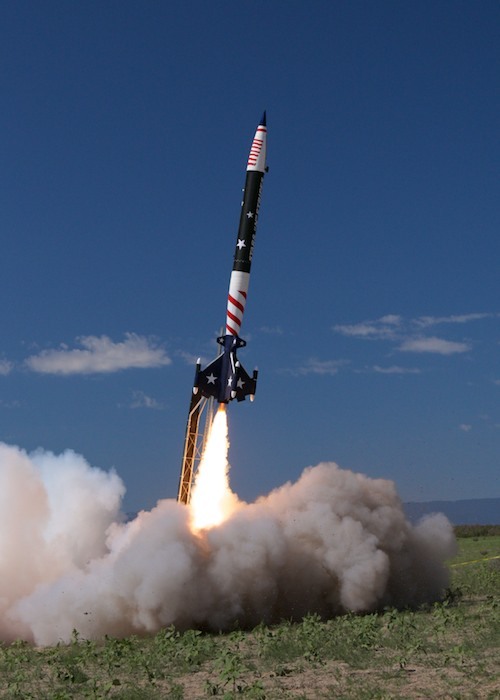 Stars ‘N’ Stripes is one of three high-powered sport rockets built and refurbished by ULA summer interns. ULA interns volunteer to work on the rockets outside of their “day jobs,” building and testing the rockets with the guidance of ULA employees, who participate as mentors. This voluntary activity is an integrated effort with Ball Aerospace interns, who build the payloads for the rocket. Interns have been working on upgrades this year, which include an aft end that incorporates a new Avionics/Parachutes/Engine (APE) module. Two of these modules will be built, allowing for a second, day-time launch at 12:50 p.m. on Saturday. The APE modules will increase the length of the Stars ‘N’ Stripes rocket from 17 feet to 20 feet, and will increase the diameter of the rocket to 14 inches. Lights are also being added, which should make an impressive display as the rocket shoots approximately 5,000 feet into the night sky. Since ULA’s first intern rocket launch in 2008, it has provided valuable learning experience to aspiring engineers and rocket scientists from elementary school through graduate school. The intern program simulates real-life launch experiences for the interns and encourages kids of all ages to pursue careers in science, technology, engineering and math (STEM) fields. Last August, the Rocky Mountain Air Show in Broomfield became the first civilian air show sanctioned by the FAA to have a high power sport rocket launch. ULA has been working with the FAA to establish guidelines that will eventually allow never-before-seen demonstrations at air shows across the country. The first test launch was conducted at Rocky Mountain Metropolitan Airport in Broomfield in November 2012. All activities were conducted under the supervision of the FAA and provided valuable data regarding this type of operation in an airport environment. This year’s air show has been moved to the Weld County Airport in Greeley due to construction at Rocky Mountain Metropolitan.